Established: August, 1981. Elevated to barony status on November 9, 1991. Blazon: Azure, a duck naiant to sinister argent, billed, within a laurel wreath Or. 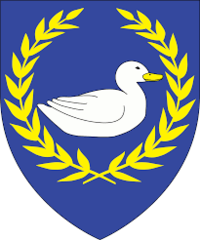 Populace Badge: Per fess wavy azure and barry wavy argent and azure, a duck naiant contourny argent billed Or. The Bronze Duck - For noted service to the barony. There is no limit to the number of times an individual can receive this award. This award is not limited to the populace of the Barony of An Dubhaigeainn. The Drake’s Spur - For those individuals of the Baronial populace of An Dubhaigeainn that show skill and dedication to one or more of the martial arts within Society. The Silver Egg - For those individuals of the Baronial populace of An Dubhaigeainn under the age of 18 years that demonstrate courtesy and service within Society. The Baroness’s Favor / Coronet Token For an individual or individuals that demonstrate courtesy and chivalry of note. Silvanus Doke For those who have fostered and helped An Dubhaigeainn grow, like a farmer and a field. Not just service but the true wanting to make the Barony prosper and grow. The Roasted Duck - For those individuals of the Baronial populace of An Dubhaigeainn that show skill and documented research in one or more arts and sciences within Society. Order of Perseverance - The intent of the award is to encourage members to have a more diverse and well-rounded experience in the Society, and will have requirements for participation in each of the three classic “pillars” of the SCA: Martial, Arts & Sciences, and Service. Recipients will need to demonstrate a level of participation in all three areas, but no one specific activity will be required of anyone. This page was last edited on 1 September 2018, at 15:56.